What beam size to use for 20ft by 20ft shed? 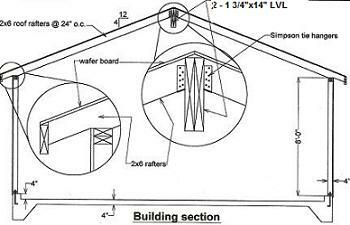 Assuming the beam size you're looking for is for the ridge beam at the highest point of the roof as shown below. The beam is to span unsupported the entire 20ft. The building section below show two 1 3/4" x 14" Microllam LVL beam will be sufficient to carry the load of 30 pounds per square foot(psf). If snow load is not an issue, two 1 3/4" x 11 7/8" should work. If LVL is not available, a 6x14 DFL#2 lumber will also work to span the entire length of the shed without a column at the middle. If you are in area with no snow load, a 4x14 will work. If a column is to be installed at mid span of the beam, two 2x10 will work for snow load and 2x8 for areas where snow load is not an issue. All cases mentioned above, whether snow load or not call for 2x6 roof rafters spaced at 24 inches on center. Where the clear span beam comes in contact with the walls, wood columns will be required one at either side of the beam. To make framing easier so that no extra furring is required, 4-2x4 studs are intended to be the columns. All these studs to be nailed together one adjacent to each other. At the bottom of each column requires footing minimum of 2ft square. These footings can be spot footing or cast monolithically with the slab and continuous footings. If there is no truss manufacturer in your area, the shed shown above is a good alternate for roof trusses. If long span lumber is not available you can install a column at mid span to cut down the span so you can use smaller size beams. Steel beam is another alternate that can be used for this application as well.